Introducing amazonite, a feldspar curiously said to be named after Brazil’s mighty Amazon River, though deposits of amazonite have never been found in its proximity. Amazonite is valued for its attractive blue-green hues and its harmonizing properties. Read on to learn more. Colour: Green to blue-green, opaque to transluscent, sometimes with a fine white lattice pattern. 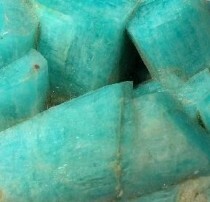 Amazonite is a variety of microcline feldspar. The feldspars are crystalline aluminosilicates that are very prevalent in the Earth’s crust, forming in lava flows as they cool. The name literally translates from the Germanic ‘feld’, meaning field, and ‘spar’, meaning “easily cleaved” (split). Characteristic of feldspar is the presence of lamellae – very thin, highly reflective platelets that form in layers within the structure of the crystal. These platelets cause light to scatter and reflect between the layers, creating an iridescent effect known as “schiller”. The many varieties of feldspar consist of either potassium, sodium or calcium, or different combinations of these elements, to varing degrees. Microcline feldspars are potassium-based and commonly found in pegmatites (large-grained granites). They are usually an off-white to fleshy pink colour and very common. 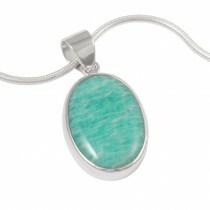 However as amazonite, it is relatively rare. It is the presence of trace impurities of lead within the crystalline structure that is responsible for the intense blue-green colour of amazonite. When amazonite crystallizes at a medium to low temperature and albite (sodium based feldspar) is also present, the albite and amazonite will separate and form into a lattice of roughly parallel layers of alternating amazonite and albite. 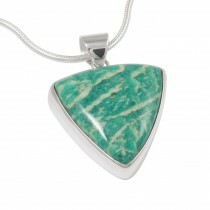 This results in a pattern of thin, white stripes running through the green amazonite. Amazonite has been used by humans for 4000 years. A popular amulet stone in ancient Egypt, Tutankhamen’s tomb revealed a scarab ring made from amazonite and parts of the Book of the dead have been found inscribed on tablets made of it. The ancient Assyrians associated it with their god, Belus. In India, Mesopotamia and pre-Columbian America, it was used as jewellery. Microcline feldspars are used in modern times in the manufacture of glass, porcelain and enamel. 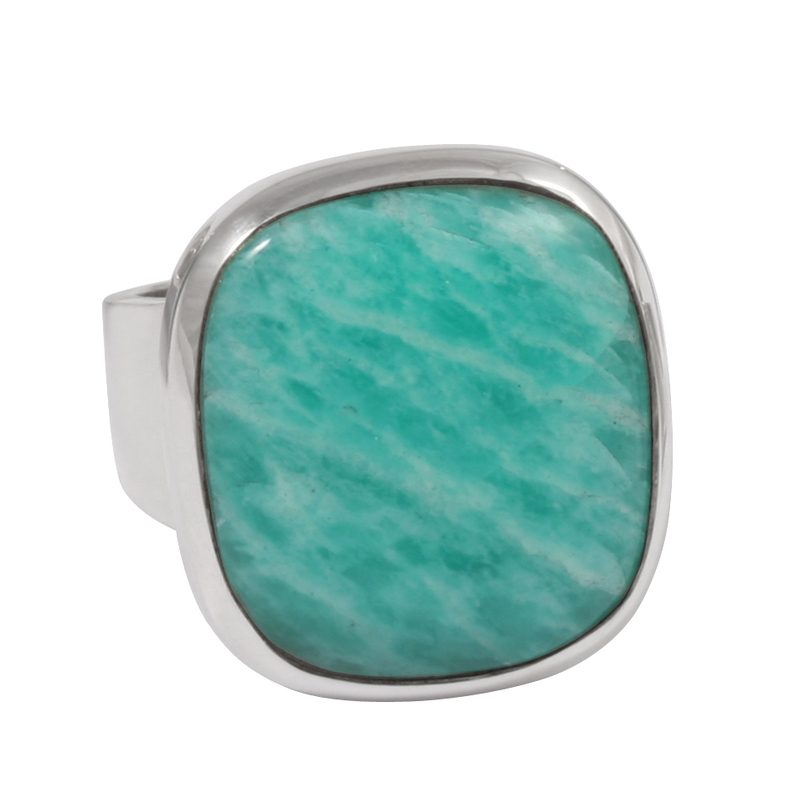 As amazonite, however, it is highly prized as a gemstone and is generally collected for gem cutting. The mines in Colorado, USA, are famous for their extraordinary mineral specimens of amazonite and smoky quartz crystals growing together and are prized by collectors. Amazonite opens and activates the heart and throat chakras, with its primary focus being balance and harmony. It is attributed with aligning the physical, etheric and astral bodies and balancing one’s male and female energies. It is also said to promote harmony between individuals, making it useful for conflict resolution. For those who struggle to stay true to themselves in the face of others’ values and opinions, amazonite helps to maintain conviction and make a stand. Perhaps that is why it has been credited with helping “lazy” teenagers. Peer group pressure and confidence issues may possibly be addressed successfully with amazonite’s assistance. Amazonite is also considered a powerful tool for manifestation. Helping us to choose our words carefully, it shows us how what we speak can empower us. It is suggested that meditating or sleeping with amazonite will stimulate visions or dreams that provide truthful insight. In terms of spiritual development, amazonite’s harmonizing aspect may help one to align both one’s spiritual and material being. 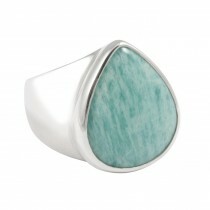 Amazonite is credited with calming and soothing one’s nerves and healing trauma. It is also said to treat calcium deficiency and osteoporosis, to prevent tooth decay, cure muscle spasms., treat eye disorders and water retention, and to make childbirth easier. Amazonite relates to the astrological sign of Virgo and vibrates to the number 5.